H & W Utility Contractors has provided quality workmanship and superior customer service in the excavation/utility/paving industry since 1986. 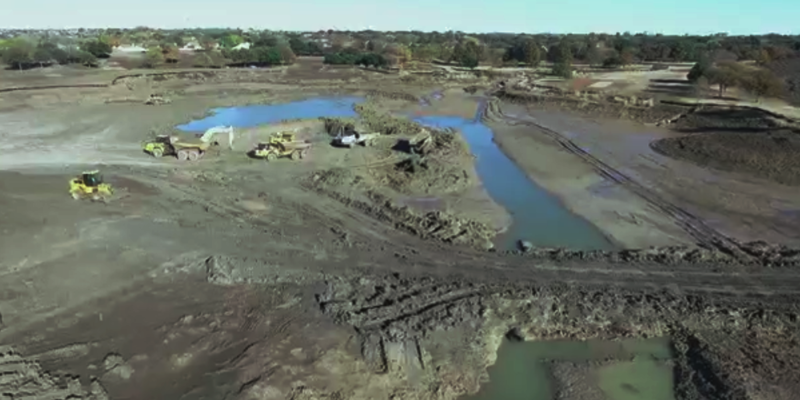 Our services include: excavation, clearing, mass grading, lot grading, moisture conditioning, demolition, soil stabilization, construction of ponds and lakes, water/sewer/storm drain installation, and paving. Most commonly, our projects include commercial and residential subdivisions, sporting fields, and golf courses; be sure to check out our portfolio page for an extensive list of projects we have completed. H & W faithfully serves its clients in the Dallas/Fort Worth, Texas, Oklahoma, and Kansas areas by devoting special attention to every project. We stand behind our work, which is how we build strong, lasting relationships with our customers. If your project requires the highest level of competence and timely completion, H & W would like the opportunity to work with you. Achieving the highest level of operational excellence includes maintaining our outstanding safety record and environmental stewardship. Safety and environmental awareness at your job-site are important to you, the public, and H & W Utility Contractors. We exercise great diligence in cultivating safety-minded employees and safe job-sites. We care about our employees and understand that the success of your project is impacted by our operations. We employ third-party regulatory specialists to administer training sessions and inspections to keep our staff on top of regulatory compliance issues. We are proud of our exceptional safety record – the result of diligent effort and proof of our commitment to excellence and our clients. Additionally, H & W is fully insured and has provided payment, performance, and maintenance bonds for over 20 years. You can trust H & W to handle your project with the utmost level of professionalism and corporate responsibility.